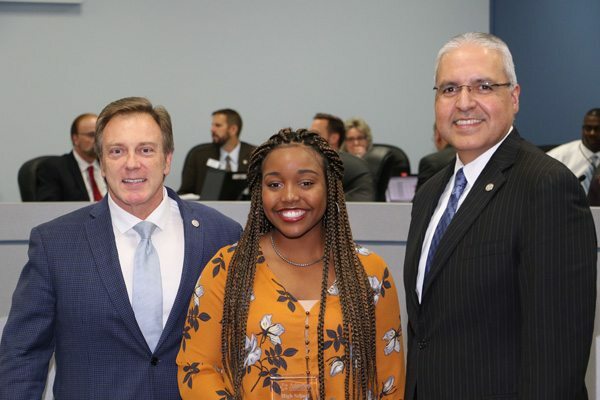 Back to top ↑ Arlington ISD > Congratulations November 2017 Student of the Month! Congratulations November 2017 Student of the Month! Congratulations to Courtney W. from Bowie High School, the November 2017 AISD Student of the Month! Courtney is a well-rounded student who is involved in multiple activities, serving as a leader on campus as well as an active volunteer outside of school at Bowie. Courtney is enrolled in the International Baccalaureate program at Bowie, and she has served as a class officer for four years. She has participated in Youth Leadership Arlington, National Honor Society, Health Occupations Student Association, Project SOAR, AVID, Delta/Academy Gems and the University of Purdue Engineering Camp. Courtney is also on both the Bowie varsity softball and cheerleading teams. Even with her academic and extracurricular involvement, Courtney finds time to serve others at Mission Arlington in the Medical Clinic, during Bowie Gives Back and Spookapalooza, through the Dallas Furniture Bank making blankets, and at homeless shelters as a part of the Delta Gems and Dallas Salvation Army. Always athletic and energetic, Courtney was diagnosed with scoliosis in fifth grade at West Elementary. Courtney received treatment from the Texas Scottish Rite Hospital and had spinal fusion surgery on Nov. 28, 2011. She has made a full recovery and has now become a spokesperson for Scottish Rite. Through this experience, Courtney discovered she wants to enter the medical field as possibly an anesthesiologist or in orthopedic care. Courtney would like to attend Howard University, Morgan State or Florida A&M. She is a shining example of the great students at Bowie. Congratulations, Courtney!